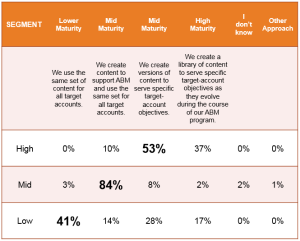 In our recent research we found that 90% of high performing ABM programs create content that is versioned to achieve specific ABM objectives. Check out this short video to hear first hand from one of the worlds renowned experts in ABM content, Johan Sundstrand. As CEO of Freya News, his team enables amazing content strategies for some of the largest and most successful ABM programs in the world. Are you ready to make the move to high-performance ABM? Learn how to focus your attention to those accounts that matter most, and become expert in knowing how to best advance stages of engagement, speed to revenue.